Last night, I swapped out normal bedtime activities for a little RPG fun with Sean and Kaylee, as I have been known to do. For some reason, I always seem to ‘find the time’ to do this sort of thing on a night when I have a hard stop looming (in this case, a Star Wars game at 8pm), but we did manage to get the evening sorted out pretty quickly, giving us close to an hour to play. 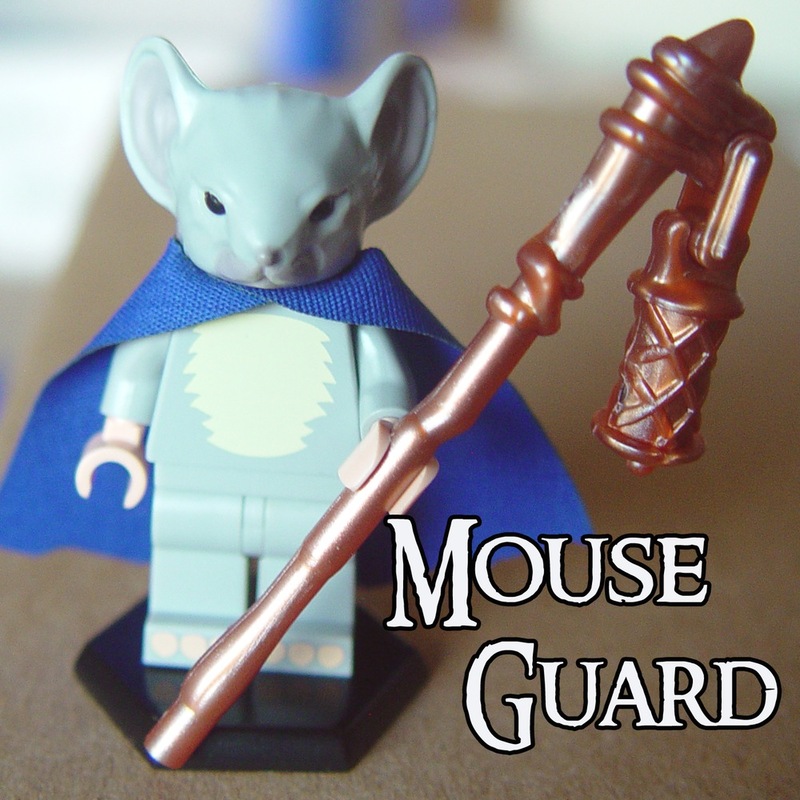 Since we’d last played Mouse Guard (using a variant of the Risus rules set), I’d done a little shopping, and picked up a couple cool, custom Mouse Guard lego figs from crazy bricks – mix them together with a some weapons from Brick Arms, and we had pretty good minis for Conner and Laurel. Do I need minis for this game? I do not. Not at all. Did I want them for the kids to play with anyway, so they can gave Mouse adventures whenever they want? Yes I do. So we grabbed our dice-rolling frisbee (hot tip: have smaller kids roll their dice in a frisbee or something similar – it really keeps the dice-chasing down to a minimum), the index cards on which we’d scribbled character sheets last time and, with Zoe tucked in and Momma running some evening errands, sat down to play. “So, in case you don’t remember…” I began. I mean, seriously: the kid is five, and we haven’t played in two weeks. He can’t remember where he left the socks he had on five minutes ago, but this… this he remembered. Laurel travels light, with a narrow-bladed sword, a few daggers, and small pack of supplies. 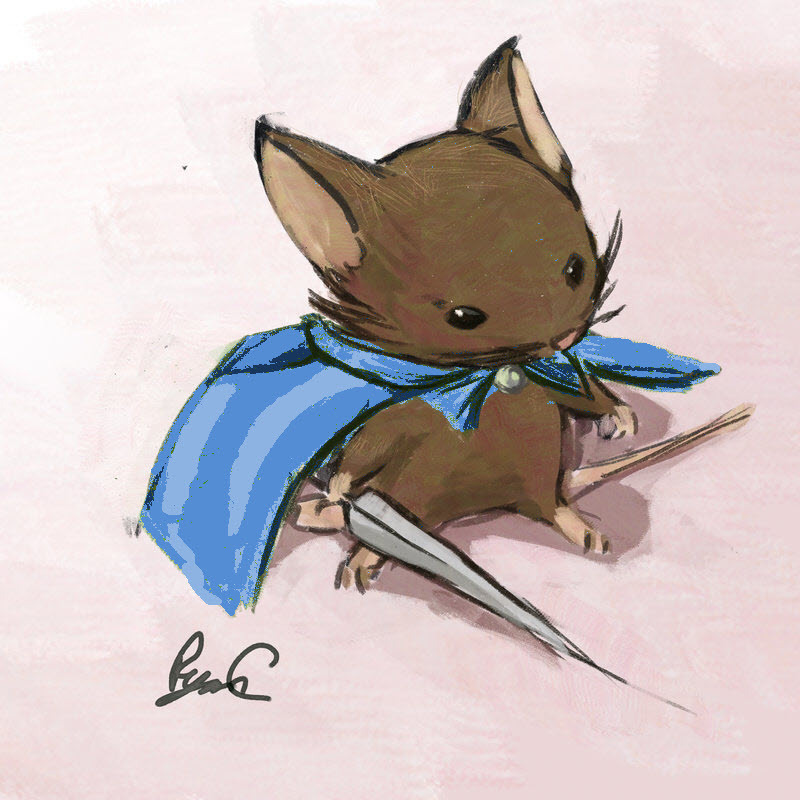 The two guardmice, with the assistant post-mouse in tow, went to the head postmouse’s home and started investigating. Windows were damaged. The front door was torn off the hinges, and the inside was in worse shape. The mice did some digging, and discovered some footprints in the flour scattered around the kitchen. Laurel (Kaylee) was able to identify the prints as weasel tracks, and Conner (Sean) realized they led down into the cellar. Right about here, Zoe (two and a half) decided she wasn’t ready for bedtime, and showed up at the edge of the table, staring wide-eyed at the dice. Yeah, I’m not going to say no to that. “Zoe, do you want to play a butterfly?” Kaylee asked, pointing out her sidekick to me. “I- I’m c-coming with you,” said the assistant postmouse as the two guards headed down into the cellar. The three mice got into the basement (some confusion here, as Zoe thought we were supposed to pick up all our things and go down into our real basement), and found a tunnel dug through the side of the cellar, behind a big shelf. 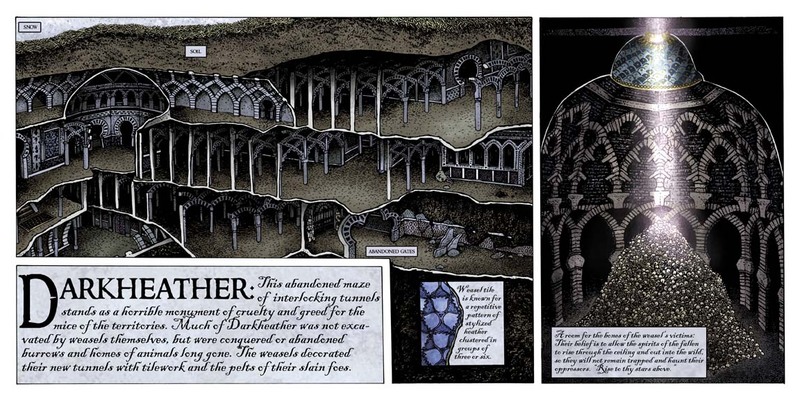 They followed the winding tunnel (hand-dug, but seemingly not that new) until the air began to change, becoming dustier and more mildewy… then it opened into a much broader space: the many-pillared spaces of Darkheather! Laurel was astonished – she had no idea Darkheather extended so far under the Territories. As soon as they could make out voices and the sound of flowing water, they stopped. The weasel and the mouse where talking, and they didn’t sound like enemies. “This bag is full of nothing but papers!” the weasel hissed. “Can we grab that mouse?” asked Kaylee. Laurel moved to pin down the postmouse (working with her companion), while Conner charged straight at the weasel. “I’m going to jump right at him and chop his nose into pieces!” announced Sean, and he did… something with his mouse figure that snapped the blade right off his little plastic sword. Oops. Kaylee rolled enough successes (we’re counting 4, 5, 6 as successes – part of the Risus Guard rules I’m using) to pin down the postmouse, and Zoe had her bumblebee buzz right at the weasel’s head to distract him. Sean came in, rolling his four dice, and got two sixes and a five. Now, in this system, sixes explode, so he can roll two more dice and count them. Six and a two. The kids are howling with glee. Taking Sean’s minifig mishap as inspiration, I described Conner leaping out at the weasel and chopping the sword down into the weasel’s nose so hard it went right into his head and stuck, breaking the blade off before the weasel tumbled into the water. It was a real “Lieam versus the snake” moment. Flawless victory. 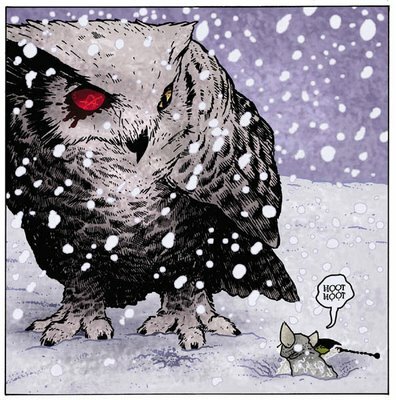 The mice retrieved the letter satchel, turned the traitor postmaster over to the locals, and prepared to head back to Lockhaven to report to Gwendolyn. And, just to reiterate: Roll dice in a frisbee or something similar – it really keeps the dice-chasing down to a minimum. So: good game, good fight, good night!